By drbubb, July 14, 2016 in Campaign 2016 threads: "Discernment"
Why I think Hillary Rodham Clinton is a "Dead Woman Walking"
Kelly File 7/5/16 Full: NO CHARGES for Hillary! Megyn Kelly Shocked! I wonder if Bill will keep her company? Democratic presidential candidate, former Secretary of State Hillary Rodham Clinton calls on Congress to end the trade embargo the U.S.
WASHINGTON (AP) – House Republicans are asking the U.S. Attorney for the District of Columbia to investigate Hillary Clinton and determine whether she lied to Congress. Reps. Jason Chaffetz of Utah and Bob Goodlatte of Virginia say in a letter sent Monday that FBI evidence “appears to directly contradict” several of Clinton’s statements under oath. Clinton testified last October that she never sent or received emails marked as classified when she served as secretary of state. She also has said she only used one mobile device for emails and turned over all of her work-related emails to the State Department. FBI Director James Comey said she had multiple devices and investigators found thousands of work-related emails that had not been turned over. He said three of her emails carried classified markings. 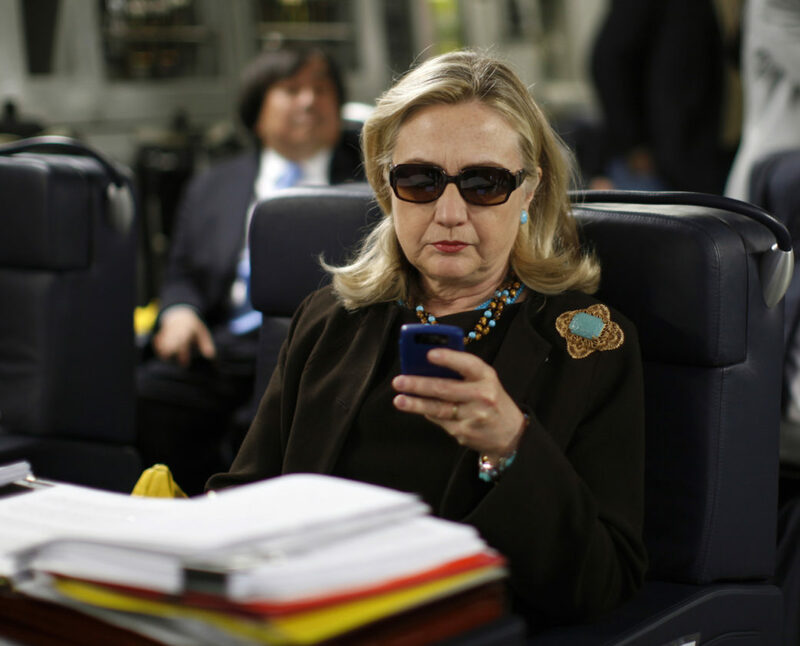 FILE - In this Oct. 18, 2011, file photo, then-Secretary of State Hillary Rodham Clinton checks her Blackberry from a desk inside a C-17 military plane upon her departure from Malta, in the Mediterranean Sea, bound for Tripoli, Libya. Special prosecutor Ken Starr had a lot of questions he wanted Hillary Clinton to answer regarding the death of Vince Foster, her good friend and a person her husband had known since boyhood. Hillary and double jeopardy - an accused person cannot be tried twice for the same crime. "... So should we continue to spend taxpayer money for another 20 years investigating the same things? What if every court case where someone was found not guilty could be tried over and over and over again?" She was never tried... in fact she has not been indicted (yet) on these charges. Can be taken up again. Indeed, it is already being taken up by Congress - fro whom she lied under oath. supporters may deny it.) I still think they will get her, and very possibly prove some other more serious crimes along the way. in hiding the crimes, just in delaying the indictment for a bit. I may still be celebrating her conviction before too many more months have gone. I do hope they do not use Comey's FBI to investigate the Clinton Foundation - where is the IRS on this? "They may be guilty of 200 incidents of Conflict of interest while amassing $48 million"
"Did Hillary Clinton give non-cleared people (her lawyers) access to classified information"
Is Hillary Clinton Dead? Where is Hillary ? and said 'DEATH' instead of 'HEALTH"
hillary dead The dragnet is now closing in on Bill Clinton and the Clinton Foundation, Pentagon and agency sources say. Once that is exposed, the entire corrupt Washington DC establishment will crumble, the sources say. HOW is she going to get people to follow her lead?? She doesn't have the aura of a leader - far from it ! Why exactly is the "Hillary is dead" theory spreading? Did Zach Galifianakis Throw Hillary Under the Bus? 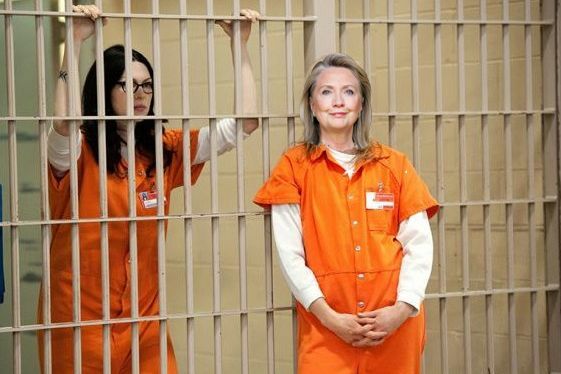 No doubt, this encounter was scripted, but would anybody find this episode funny, or "humanizing" for Hillary? She seems to be drugged up, to me, and only vaguely aware of what is going on. She needed assistance to get onto it as she could be seen reaching her hand out for a boost or some added steadiness. An aide extended his hand and Clinton held on tightly as she made her way up the 18 inches. Hillary looked pi$$ed last night, or she had another 'episode'. Or maybe both! There are rumours that she collapsed last night at her last rally. Supposedly Springsteen was introducing her but she didn't come back out, so he picked his guitar up and started playing. There's not much on Twitter about it and this is the only link I can find, so it could be rubbish, but I'm guessing the video above is taken after the concert so it would tie in. It's definitely reminiscent of the 9/11 'episode'. Filmed by a Bloomberg journo I believe. If somebody had filmed her at the rally it could have sealed it for Trump. It might not even be true that she passed out, but it's a possibility.